The Holland Computing Center (HCC) provides the primary high performance computing resources for J. Yang lab. This document below serves as a reference for the most commonly used commands and workflows for the workload manager SLURM. This documentation borrowed much of its text from Ross-Ibarra Lab wiki and blended with HCC documentation. Key: User, Group and Entire system. $HOME directories are backed up daily. But the size is small (20GB per user). Normally used for configure files, user defined functions, user installed software packages. $WORK is large, 50TB per user. But purge policy exists on /work, see here. For computing and working. But, DONOT use it to store RAW Data. New file system. 1TB per use for free. No backups are made! Don’t be silly! Get an account here: ask Jinliang to learn our group id. Connecting to crane using SSH. Replace username with your username. This will allow you to ssh to crane with just ssh crane in the future. Slurm is job managing system: you submit jobs via batch scripts. These batch scripts have common headers; we will see one below. Here we see our PARTITION and TIME LIMIT, and all of their inferior but still useful friends. Note that there is a column of STATE, which indicates the state of the machine. A better way of looking at what’s going on on each machine is with squeue, which is the job queue. This shows each job ID (very important), partition the job is running on, name of person running the job. Also note TIME which is how long a job has been running. It’s that easy! Slurm is pretty boring so far; all we can do is look at the cluster and try to kill jobs. Let’s see how to submit jobs. We wrap our jobs in little batch scripts, which is nice because these also help make steps reproducible. We’ll see how to write batch scripts for Slurm in the next section, but suppose we had one written called steve.sh. To keep your directory organized, I usually keep a scripts/ directory (or even slurm-scripts/ if you have lots of other little scripts). In each project directory, I make a directory called slurm-log for Slurm’s logs. Tip: use these logs, as these are very helpful in debugging. I separate them from my project because they fill up directories rather quickly. Let’s look at an example batch script header for a job called steve (which is run with script steve.sh) that’s in a project directory named your-cool-project (you’re going to change these parts). -D sets your project directory. -o sets where standard output (of your batch script) goes. -e sets where standard error (of your batch script) goes. -J sets the job name. -t sets the time limit for the job, 24:00:00 indicates 24 hours. Note that the programs in your batch script can redirect their output however they like — something you will like want to do. This is the standard output and standard error of the batch script itself. Also note that these directories must already be made — Slurm will not create them if they don’t exist. If they don’t exist, sbatch will not work and die silently (since there’s no place to write standard error). If you keep trying something and it doesn’t log the error, make sure all these directories exist. As mentioned, the jobname is how you distinguish your jobs in squeue. If we ran this, we’d see “steve” in the JOBS column. Make sure you switch your user name for USERNAME. You should see a bunch of files named “error” and “out” show up in your home directory. Try launching this using sbatch -p jyanglab to make sure you have access to both queues. This will drop you into an interactive R session on the partition specified by -p. --pty launches srun in terminal in pseudoterminal mode, which makes R behave as it would on your local machine. With srun you still have to set a time limit. $ srunx your-partition Make sure your `X11` is open before you typing the command. Using ssh -Y with X11 may seem like good idea, but this does not specify a partition to work interactively in, so you will end up running things on the head node. Bad idea. Do not run anything on the headnode except cluster management tools (squeue, sbatch, etc), compilation tasks (but usually ask CSE help for big apps), or downloading files. If you run anything on the headnode, you will disgrace your lab. How embarrassing is this? 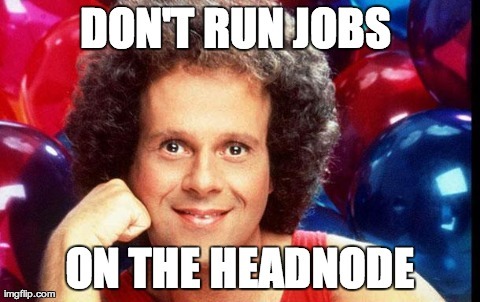 Imagine if you had to give your QE dressed up like Richard Simmons. It’s that embarrassing. Monitor your disk space, as it can fill up quickly.